OEN, or Outbrain Extended Network, is a powerful service that allows you to access a wide variety of publishers beyond Outbrain’s direct partnerships. By granting instant access to thousands of new premium publishers, OEN programmatically increases your reach and can improve your campaign performance significantly. Like all Outbrain campaigns, OEN uses Outbrain’s proprietary Interest Graph© and unique behavioral data to identify opportunities in the RTB (real-time bidding) marketplace. This extended reach is part of the Amplify platform and comes at no extra cost. In addition to providing your campaigns with more scale on over 5000 premium publishers, each OEN publisher has been fully vetted and meets our guidelines for brand safety. OEN performance is fully visible in the dashboard, and any publisher or section made available through OEN will be labelled with an OEN icon. As with any other publisher, you can review and exclude these publishers using the By Publisher’ and ‘By Section’ reports, and you can adjust your CPCs for OEN publisher sections using the ‘By Section’ report. Finally, you may opt in or out of OEN in the ‘Targeting’ section in your campaign settings. Still aren’t sure what OEN is or how it works? Our Support team is here to answer any questions you have. Can I buy Outbrain programmatically? What information does Outbrain track about readers? How does Outbrain comply with GDPR? 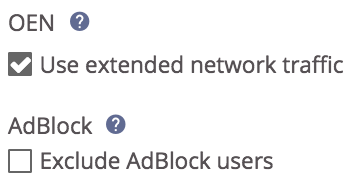 What are your Outbrain Amplify Terms and Conditions? How do I read and customize my performance reporting? How do I add UTM tracking to my campaign? How can I track and optimize publisher engagement in Google Analytics? Why is there a difference between Outbrain reporting and Google Analytics? How do I use 3rd Party Pixels for my Outbrain campaigns?